Class will start with a warm-up from head to toe, circular movements, and slowly build up to drills. After drills a combo/routine will be taught including steps from the drills as well as new steps to challenge the students. The goal of this class is to comprehend and learn all the various steps as well as to musically find character within each student. Students will be placed in groups to perform the combo before the end of the class without the instructor. We’ll finish class off with a cool down. Michael Diaz was born in Santo Domingo, Dominican Republic and now lives in Pawtucket, RI. At the age of 11 years old, Michael was inspired by a music video of Chris Brown, and hasn’t stopped dancing ever since. 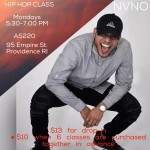 He was mentored by Kelvin Fabian, Tovah Muro and Rhode Island’s notable teacher Nikki Carrara. He is known for his ability to improv and for his stage presence. His participation in national conventions and competitions resulted in various scholarships including The Alvin Ailey program and Broadway Dance Studio both in NYC. After graduating from a performing arts high school In 2015, Michael decided to continue his journey of dance by joining an urban dance company called “Thr3e Live Dance Co. He is currently still with them and defining.